Popular satirical presenter on Sahara Reporters TV, ‘Dr. Damages’ has taken to Twitter to slam the owner of the platform he presents on, Omoyele Sowore who is running for President in 2019. 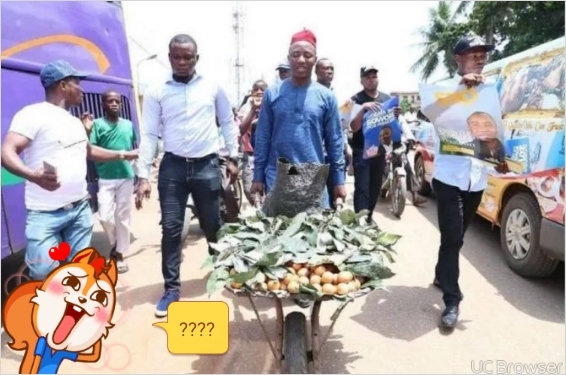 Sowore was pictured pushing a wheelbarrow containing oranges which is a sight common in many parts of Nigeria with young men selling fruits and vegetables in markets and on the roadside in their barrows. Dr. Damages is obviously not impressed at this attempt at populism. Many Nigerians on social media have criticised Sowore observing that he is using tactics similar to those of ‘typical’ Nigerian politicians which his campaign says he is out to replace. Some ardent of supporters of Sowore believe he has done nothing wrong though explaining that it is just a publicity stunt that helps to get more people to know about their presidential aspirant.